So folks, there I said it (in the title). And again here, I might be old. I came to this realization a couple weeks ago when walking around Target after the gym (see! example #37 of why), and they had all the Valentines decor out. I now want decorations and festive stuff for all the non-Holidays! Growing up, only Mom's did this. Only Grandma's did this. Not cool young kids. I fully expect my fully grown college kids may walk through the door at any moment... I kid, sorta. Am I really old? Or is the stuff getting cuter? The advertising better? What gives? I swear I'm not 43...although I am knocking on 30's door (SOB, bye 20's!). I don't think it's an old thing at all! I've always loved decorating for all Holidays. It makes me happy! I wish I had more Valentine's Day stuff. I too spent a hot second adoring all the V-Day stuff at Target and left with nothing (willpower at Target is my new thing this year). I really liked the Admit One candy dish as well! Now, my mom has a tree she leaves up year round and just changes out the decorations...that to me is teetering on grandma style! You're not alone, don't worry! Love your valentine's day garland/bunting - I might just need to make one, since my walls look bare without the Christmas decorations. Can't wait to see your "miscellaneous" holiday box in the garage one day ! ACCESSORIZE _ I LOVE IT!!!!!!!!!!!!!!!!!!!!! Perfect way to put it! i would just like i say i TOTALLY have those tea towels! valentines day stuff is just TOO cute! so no, you're not alone lady!! I go nuts in Target during the holidays. Last year I bought dish towels, cups, everything! All with hearts on it, of course! It's cool. I'm 21 and I did the exact same thing yesterday... It's a thing. We definitely used to decorate my college apartments / houses with tons of festive decor for every (and I mean every) holiday. Seeing it always made me feel so cheerful! And not only do I still decorate, but I definitely would not have been able to control myself at Target either. This is hilarious. 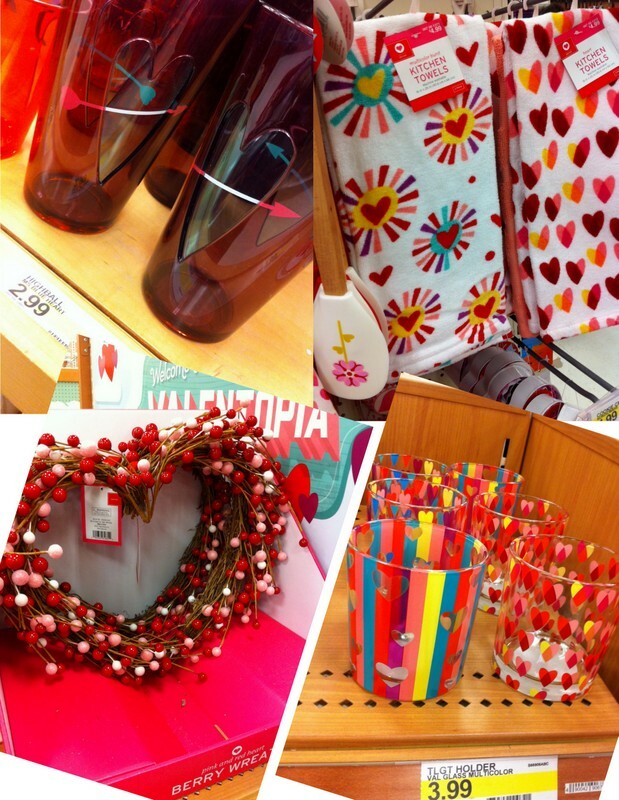 I am obsessed with Target! Their Valentine's decor is absolutely adorable this year, and I'll admit some of it made it home with me too. I'm almost 40 and hate theme/holiday stuff except for Christmas so it's not an age thing. I love Valentine's Day! That garland is too-cute! The heart glasses are super cute!